Lighthouse 1101 features 16 floor-to-ceiling windows, 11 floors up and an 800 square-foot deck wrapping 180 degrees from southeast to southwest...the effect is spectacular. 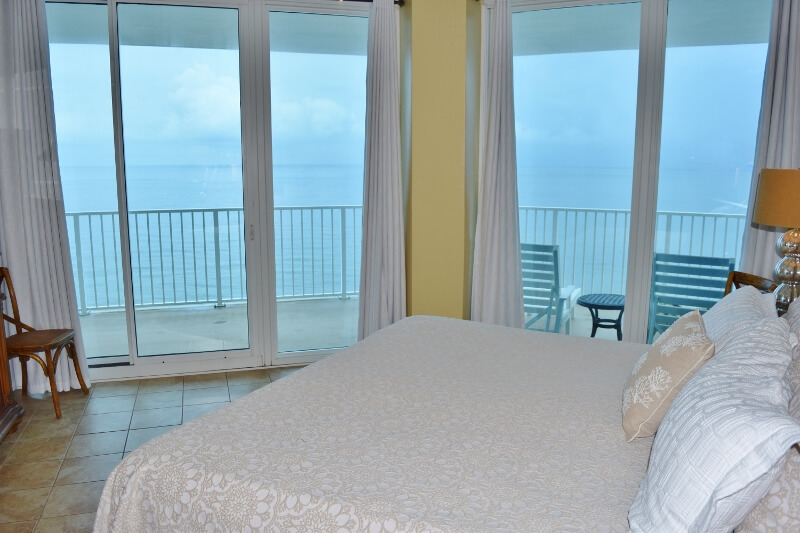 The unobstructed views from almost every room go on forever across the beautiful Gulf and carry you from sunrise to sunset. 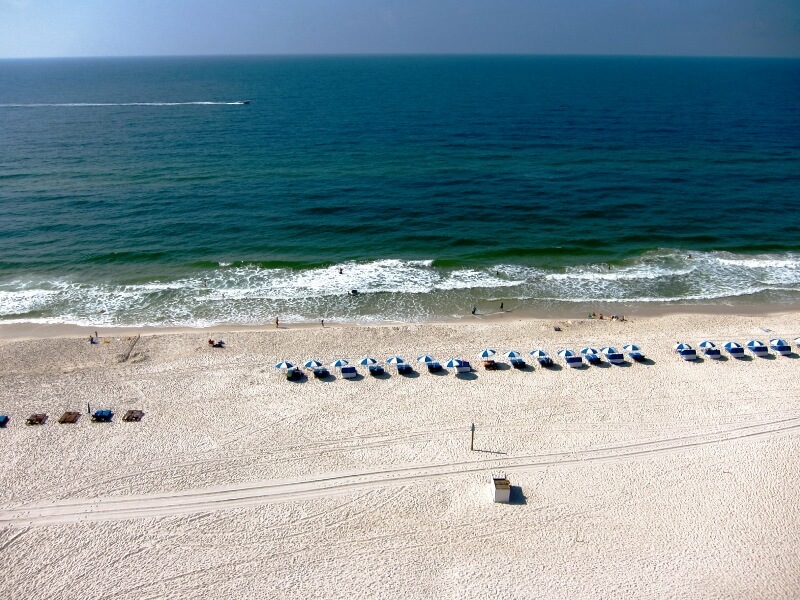 Down below the sparkling white sands of Gulf Shores famous beaches stretch out for miles in either direction. 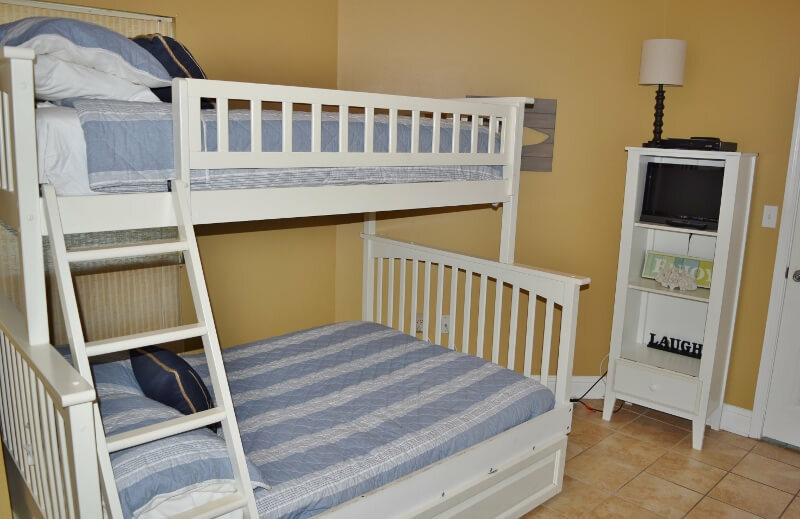 The condo has 3 bedrooms and sleeps up to 10 guests (max 8 adults) and allows for up to 2 parking passes. Inside, you will find over 1,550 +/- square feet of beautifully appointed, resort-casual decor. From your counter perch along your fully-equipped stainless-steel kitchen, Keurig Coffee maker, turn to look across your spacious great room and out at the endless waves. You'll appreciate the new updates throughout the condo including a fresh look in the living room and in all 3 bedrooms, plus comfy new mattresses. The master and second bedroom boast their own private access to the deck. 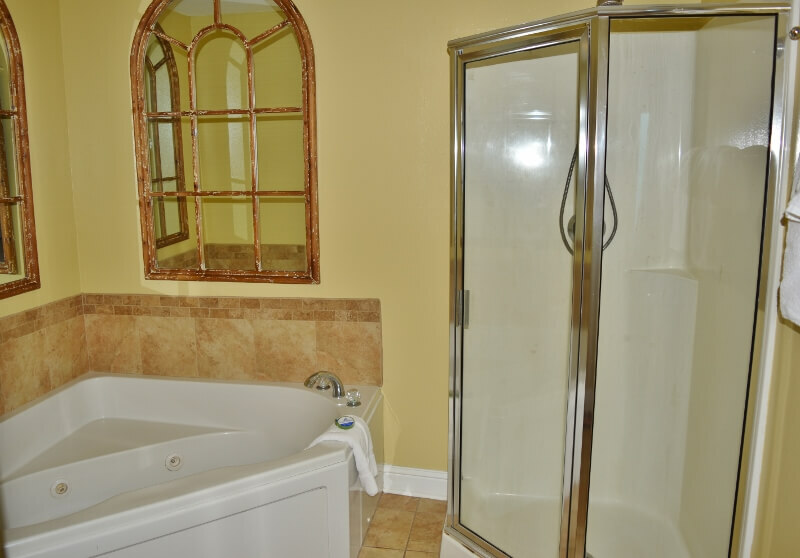 The luxury master bath has a whirlpool tub. Master has a HD Flat Screen Smart TV and TV & DVD in the other two bedrooms plus a a major electronic suite including an ultra High Definition Flat Screen Smart TV for your latest Netflix, Amazon Prime or other web-based streaming series in the great room for the evening's distraction. There is even a wet bar waiting for you to supply that perfect vacation libation. Practical appointments abound too, such as a big laundry room with its full-size washer and dryer, storage for beach supplies and spacious closet space throughout. The wireless internet lets you upload that day's photos to friends and family. 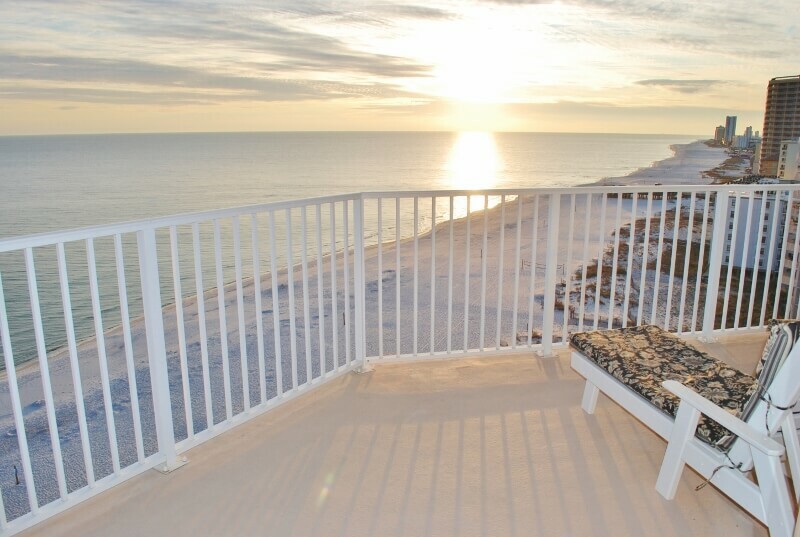 But staying at our Lighthouse home has much more...650 feet of pure white sand along the lapping waves of the gulf, 2 big zero-entry pools with lots of private deck and lounge chairs to soak away hours in the sun. There are two hot tubs, an indoor pool, a complete fitness center to work off all those margaritas and fried shrimp, and even a sauna to absorb the evening's fun. 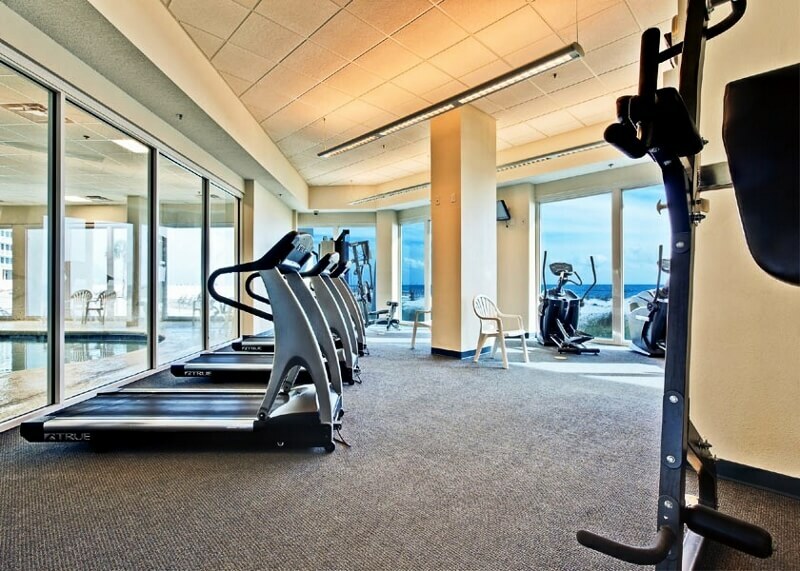 Condo was beautiful with a fabulous view and offered amenities that most condos do not. However, the living room sofa was extremely worn and the foam was out of the cushions. The master bedroom mattress needs replacing, and the shower flooring had a piece missing as well as the patio. Our pillowcases had black mascara smeared on them and the baseboards had lots of chips. Some reviews surprise us and this is one of those. The guests who came right after have stayed there several years and are not shy about commenting on condition but reported things looking very good. Please call us if something doesn't meet expectations--we should have caught the mascara stained pillowcases and would have been happy to come replace those. We have no idea what the comment about the foam being out of the sofa cushions means, we did not see that before or after this guests stay, but we will re-examine it. The sofa is about 3 years old, and the sleeper mechanism was replaced last winter following guest damage, so it should still be great for a couple of years with the regular steam cleaning we do. The master bedroom mattress was purchased 11 months ago and we have not had any complaints but mattresses do bring out Goldilocks comments (what one person thinks is too hard is someone else's too soft). The queen bedroom was replaced a month ago as a normal scheduled update. All of the condo bedding and many other furnishes were updated last spring. We loved our stay at the Lighthouse 1101 condo. It is everything they described and more. Great views, and the perfect spot to spend a week on the ocean. We have been coming to Gulf Shores for the last 9 years for Spring Break and this was the best condo that we have rented yet. It was very clean upon arrival and the owners even checked in with us during our stay to make sure things were going well. Owners are great and a clean, beautiful corner unit with amazing views!! We will be back to this unit. The condo was very nice. We would recommend staying there. Nice location too. The pictures online do not do this condo justice. It has amazing views and is much larger in person. The condo was very clean and updated. We never had an issue finding a covered parking space (even though the spots are small for large vehicles). The location is perfect...close to many restaurants and shops. The property management company was very good at communicating all details to us prior to our stay (where and when to check in, what items are provided, etc...)They also checked on us during our stay as well as following up afterwards. Overall great experience, plenty of room in the condo and on the wrap around balcony. Beautiful views from every room. We had young children and the zero entry kiddie pool in the complex we awesome for them. They have two other pools and private beach access. Our only issue was that when we got there the floors were not very clean and there were a few items that we were told that were provided that were not. We love the location of the condo, especially the views. We were disappointed in the replacement cushions on the chaise chairs..very uncomfortable. Also the couch has seen better days. But we loved our time there and hope to stay there again. The couch comment was helpful! It is fairly new so we could not imagine what that meant. The sleeper mechanism was bent so that it sagged for seating--we replaced that and added new accent pillows so it is once again comfortable. We had a wonderful vacation at this property. 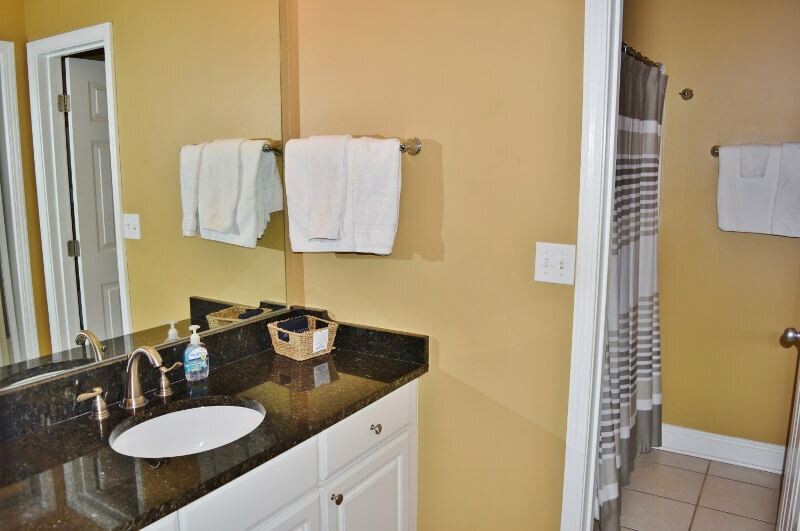 The unit was spotless and we were impressed with all the little details that were thought of including beach supplies in the laundry room and family games that were available. The balcony and the view were incredible and a high point for all of us. Since this was the first time we had stayed on the property we were also very impressed with the amenities on the site. Our only problem was having to leave that balcony behind and we look forward to coming back. This was a wonderful trip. All was clean and ready. Loved the deck and rockeorning noon and night. Very quiet and restful. Lots of room for all. We have rented a few times before from GSVR at Life of O Riley during xmas with our extended family and plan to do it again. My husband and I decided to go on a vacation by ourselves and wanted to rent from GSVR since we had excellent experience with them in the past. The Lighthouse 1101 was the only available beachfront available during the time we could visit. We find it to be very pleasant and love the location especially the wrap around deck. The only problem we had was with the parking passes. The guards weren't very nice I guess we were given white passes and they required blue passes. We told them that GSVR were to bring us blue passes on Monday but had to call GSVR and guard wanted to talk to them using my phone even after the phone call the guards told us we needed blue passes. On Monday morning the guard still confronted us about the parking passes . Later Monday afternoon we received the blue passes . Otherwise we had a wonderful relaxing time and plan to be back next summer either at lighthouse 1101 or a small beachfront house if GSVR has available during the time we can visit . We enjoyed this vacation so much. We were celebrating a graduation and 16th birthday. The environment couldn't have been better. The views are amazing, condo was comfortable and beautiful! The location is perfect. We will be back! Our family had a wonderful vacation and enjoyed the condo. Building and amenities were nice. Condo itself is showing some wear and tear and we had to do some cleaning when we arrived. Please call us if you ever find something not as clean as expected. We think you'll be pleased with the new look! This was the best condo I have ever stayed in. The balcony is wonderful. I will be back. This was a friends get together, we had girls from 3 different states meeting here. Everyone loved it. We had an absolutely wonderful time in Gulf Shores and loved your condo! It had everything we needed, even toys to take down to the beach for the kids! We stayed inside some because of the rain, but so enjoyed being in playing games and enjoying the lovely unit. Kids, grandkids and grandma have no complaints!! The condo was beautiful, comfortable & well equipped. The views from the balcony are breathtaking and the staff at the complex were all wonderful and very friendly. It's truly one of the best condo experiences I have had. The location was perfect! 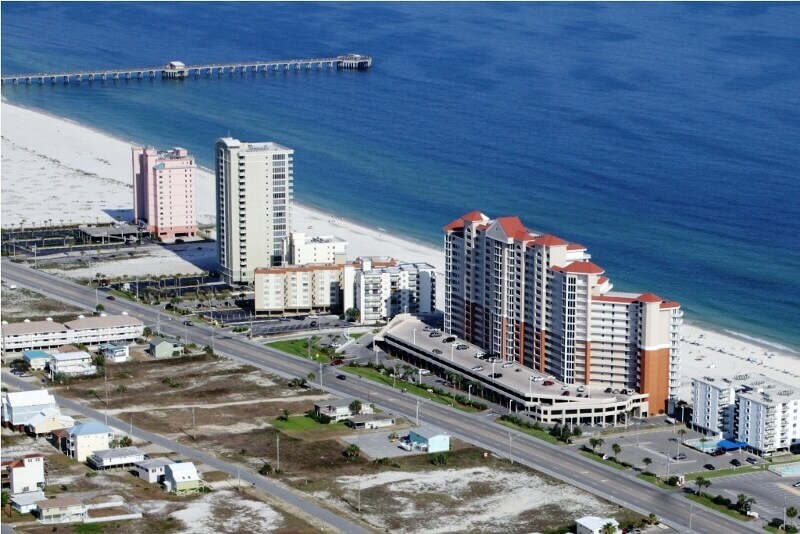 It's within walking distance to town and the Gulf State Park. My family & friends had a great time and would highly recommend renting this condo to anyone! Great time, great place, great location.....but that drive. Our stay was from Sunday thru Sunday, and those 7-days were fun and relaxing. I loved Gulf Shores, but the inconvenience to get there is what will prevent me from returning. My family and I traveled from the Detroit area and I just never want to drive for 15 hours at one time again. Normally we fly to wherever we vacation but flights to get us close to Gulf Shores were over $800 each! Also, as a responsible adult in my 40's, it would have been nice to be able to have a couple drinks while hanging out on the beach, which of coarse, the new laws there prevent that. It was a fun place to visit and I have no regrets, but unless airfare to get there can compete with most any other airport in Florida, we will just go to Florida instead. We had a great vacation staying in Lighthouse 1101. Condo was beautiful, roomy and very well equipped with everything we needed. We will definitely stay there again. The condo is exactly as it appears in the pictures! Gorgeous and clean! The view is breathtaking from the minute you step in the condo! It comfortably fit our family of 6! Awesome rental for our week long family getaway. The condo is very spacious. 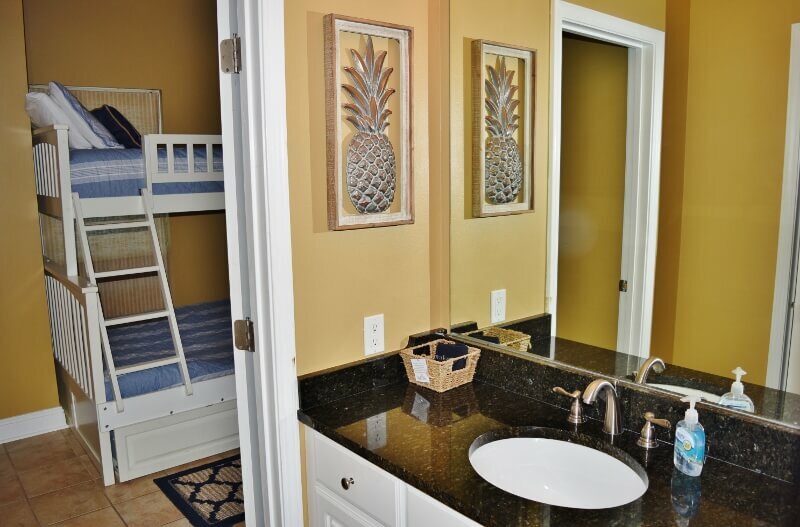 Each bedroom has its own bathroom which is a big plus for the different families. Kitchen was stocked for everything we needed. There were plenty of beach items that we could use to take with us. The huge wrap around deck was as nice as you could get. Every morning we sat out on the deck and watched dolphins. Easy walk to the east to go to the pier, or an even easier walk to the west to go to Sea N Suds or the Hangout. I've rented houses and condos all over the country and this has been one of the best experiences we have encountered. We will be back to this condo some time in the future. The overall experience was good. There was a fee that was not disclosed. The sofa had a very musty odor. I don't hold the establishment responsible for the strong winds, but the noise created by the wind through the railing kept us awake at night. It sounded like someone was using a jackhammer! The condo we rented was great. The very large deck allowed us to see sunrise and sunset from our balcony. The closet full of beach supplies including sand toys, chairs, and a beach umbrella. It made it very easy to have fun at the beach. We would recommend this condo unit, it was nice! We had a wonderful vacation. The view from our balcony was breathtaking!! The condo was beautifully decorated. Everything we could possibly need was provided! The management was excellent! Beautiful condo. Had an absolute wonderful time. We would definitely consider staying here again. The view was fantastic!! The condo was very nice and roomy. Family of four adults and three children from 6 months to 10 in age. Everything furnished and the view was one of the best ! Close to everything and fast elevators. Geoff and Susan were very good hosts. Thanks for a great vacation. This condo was a beautiful as it looks in the pictures. Had plenty of elevators and carts to bring items up and down. Would definitely stay there again. The whole family enjoyed the husband, 2 sons, daughter-in-law and granddaughter. The balcony was huge. We spent time every day enjoying the view while sipping homemade pina coladas. Really liked that there was a bathroom for each bedroom. Hope to be back next year. We thoroughly enjoyed our week at Lighthouse 1101. The condo was the perfect size for our family of 4, and the property had everything we could have asked for. The corner view was amazing, and the wraparound balcony was better than we anticipated. It was a great place to get away from the grind and relax. We will definitely be going back. We had a wonderful time at Gulf Shores. The condo is very nice and the view is spectacular. I always hand wash kitchen supplies, but I was a little surprised to find how many of the dishes and cookware were not clean. But that's not a deal breaker for this property. We would rent again, but will need a different week for next summer. Glad we found this property on VRBO. We had an absolute wonderful time. Everything was perfect. The only thing I would recommend for the condo is new mattresses. The beds weren't the best but the other was so great it didn't matter. Loved it and would highly recommend to others. Lighthouse 1101 is lovely. Only one very frustrating issued marred the experience. Slow and at times completely non-existent internet access. As two business owners who were there to work while enjoying time away from the midwest winter this was a huge issue. We wasted way too much precious time and energy indoors trying to get business done over that very slow internet. This issue puts next year at the same location in jeopardy. If you encounter problems, please call us so we can immediately start working on resolving it. We are not sure what was going on with the new internet system but since the building service providers have re-set it, our guests tell us it is as lightning fast as we had been hearing it was in other units. There is now a customer service number next to the phone and we are finding them to be very responsive. 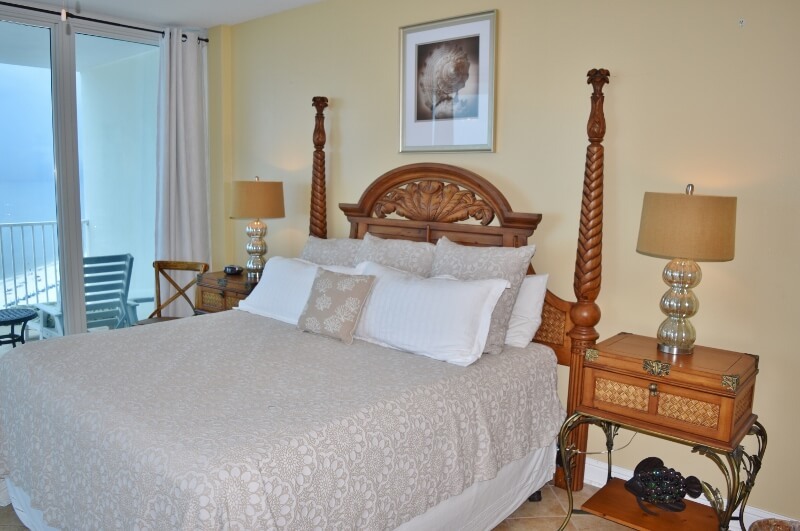 The Lighthouse 1101 is a fabulous condo located on the beach. t was clean, comfortable, well situated, and very nicely decorated. Geoff and Susan were marvelous to deal with and everything was ready for our arrival. 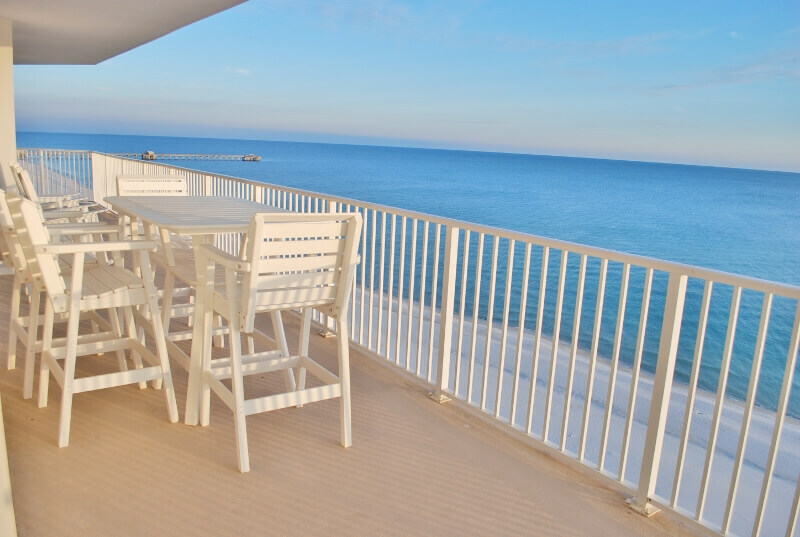 We would DEFINITELY recommend this unit and this agency if you are looking for a spectacular place on the beach and Gulf Shores had plenty to offer adults and kids. Five stars easily!!!!! Very nice condo. Very clean and worked well for our family. Wonderful stay! Great location. Beautifully decorated. Excellent and quick responses from owners while booking and staying at condo. Would highly recommend! This location was awesome, to be able to get up every morning and watch the dauphins swimming just out from the beach was great. Well furnished and had everything we needed and then some at the location. If I didnt need a bigger place next year I would stay in the same unit HANDS DOWN! We had a great time in Gulf Shores. The management company was easy to work with and contacted us several times during our stay to check in on how things were going. One thing to note about the Lighthouse building is that the doors to each unit are outdoors and you must walk on an outdoor walkway to get from the elevator to your unit. This isn't a problem for most people, but if you're bringing someone with a dislike for heights, you may want to pick a lower floor than 11 :). We loved the key box outside of the unit so we didn't have to worry about who had the room key and when they'd be back. An excellent perk. We had a great family vacation with three generations attending. There was plenty of room for all of us. The grandkids especially loved the bunk beds, walk in pool and, of course, the easily accessible beach. The grown-ups took full advantage of the huge balcony. We would definitely go back. Our vacation was awesome! We come every year for relaxation on the beach. It was beautiful weather and everyone had a great time. The condo was amazing! The best I've ever stayed in. The bed in the master bedroom was great! I always have a hard time with uncomfortable beds, but this one was a memory foam mattress and it was awesome! We would love to stay here again. It was such a beautiful location with great amenities and so much space! I would definitely rent this location again. THE BEST VACATION EVER!!! PERFECTION!!! I have to say this is the best vacation we have ever had! The condo was what we expected and more, the location was perfect, the management was professional and took care of our minor requests immediately!!! We will be reserving this condo every year for our stay! F A B U L O U S!!!!!! 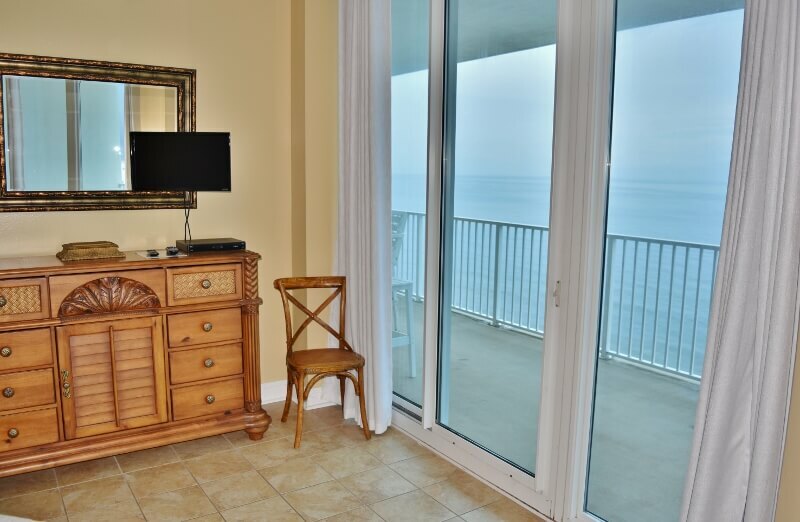 From the moment we opened the door to the beautiful view and beautiful decor of this condo it was a fabulous vacation. The accommodations were so lovely, the balcony above and beyond and it was so convenient to everything. I would highly recommend it. We've gone to Gulf Shores and Orange Beach several times and I hope we can stay here every time we go from now on. The only bad part was closing the door when we had to come back home!! :) While there we saw the Blue Angels fly, ate at the Shrimp Basket, took the Ft. Morgan ferry over to Dauphin Island and went to the Hangout plus enjoyed the beach of course and all were FABULOUS! Most Clean Condo on the Gulf!! A great vacation with family in a perfect condo! Wonderful stay in this beautiful condo! We had an absolutely wonderful time! The condo was very clean, has a stunning view and lots of space. Weather was beautiful. We'd happily stay in this unit again!! We brought our 2 daughters and their families (10 of us in all) to Gulf Shores and stayed in the Lighthouse #1101. It was wonderful. Very spacious and modern. The beach was not "shelly", which was nice for walking and the kids loved the pools. Getting to the condo was easy and there were lots of shops and activities close by. My 7 year old granddaughter said this was the "best vacation". Beautiful view, Loved the rental app, so much information. Thanks so much for letting us borrow your beach home. Fantastic property, well equipped, wonderful management company. Really enjoyed our family stay here. We really enjoyed our stay at the Lighthouse. The balcony is even better in person. We didn't want to leave. The condo had everything we needed to feel right at home. Thanks for a great vacation. The condo was beautiful with plenty of room for at least8-10 people to be more than comfortable. The views from the wide wrap around deck were amazing! The furniture and fixtures were clean and up-to-date. Anything needed for cooking, bathing and sleeping was in the room. There were also beach toys and chairs avaiable for use. It was a wonderful stay! 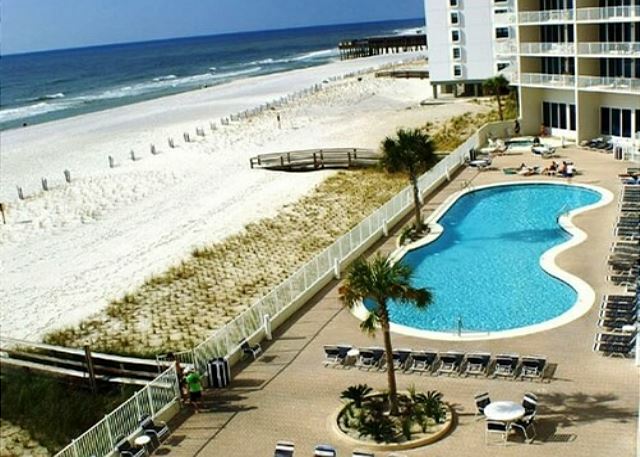 Best Place To Stay in Gulf Shores! This place way exceeded our expectations. Perfect location, close to EVERYTHING! 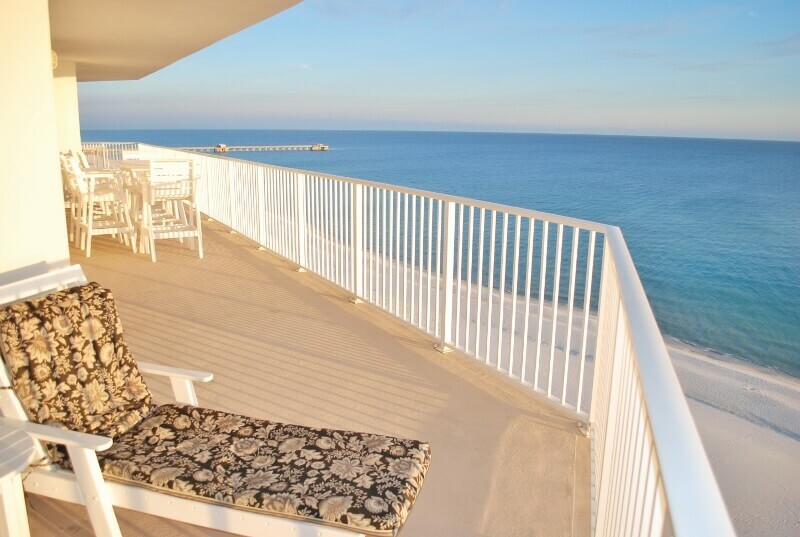 Great parking, easy access, luggage carts everywhere, unbelievable pool, excellent beach access, clean, quiet, the view cannot be beat on the 11th floor. Plenty of space. Will definitely be back.